SMPS DC would like to thank our membership, sponsors, and our member firms for making the 2009-2010 a banner year for the Chapter. 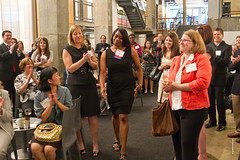 On Tuesday, June 8 attendees gathered at the Woolly Mammoth Theatre in Washington DC to reflect on a terrific year and recognize those whose contributions have impacted the Chapter and the AEC industry. 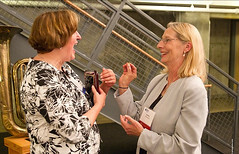 The evening kicked-off with networking and a few words from Chapter President Pat Ellis, CPSM (Faithful + Gould), who then introduced Joe Monahan, CPSM (Alpha Construction) and Lesley Arnott Rogers, CPSM (Athavale, Lystad & Associates, Inc.), co-chairs of the 2010 Marketing & Communications Awards. The Marketing & Communications Awards are held by the Chapter every two years and recognize exemplary work and innovation in firm communications. 1st Place – Brochure, HITT Contracting Inc.
Congratulations to these firms and their outstanding marketing teams! Following the presentation of the Marketing & Communications Awards, Pat Ellis once again stepped up to the podium to introduce Incoming Chapter President Alison Carney, CPSM (Balfour Beatty). Alison in turn introduced her President-Elect Joe Monahan. Congratulations to Alison and Joe; the Chapter truly has some terrific adventures in store for 2010-2011! Pat thanked the 2009-2010 board for their efforts and introduced the incoming leadership. A hearty welcome to Treasurer – Kathleen Held (Cini-Little), Secretary – Emily Wilson (AECOM), Sponsorship – Blair Plotner (HP Critical Facilities), Lunch programs – Sylvia Montgomery (Hinge Marketing), Education – Brian Reilly, CPSM (SmithGroup), Principals Roundtable – Tara Connell (ECS Mid-Atlantic), Membership – Jeff Davidson, CPSM (PSI) and Vanessa Jovel (ZGF Architects), PR/Communications – Erin Orr, CPSM ( FOX Architects) and Deborah Hayward (Studio39), Special Events – Tim Klabunde (William H. Gordon) and Katie Garrett (David M. Schwarz Architects), and Alternate - Michelle Martin (Loiederman Soltesz Associates). After confirming the 2010-2011 board it was time to kick-off the Chapter Awards program. These programs recognize marketers from all sectors of the AEC community and at all levels of experience. New Heights Volunteer Service Award: This award honors committee members who have taken responsibility for major committee efforts. Each committee chair may select one committee member to receive this award. Rising Star Award: This award is given to a chapter member with less than five years of experience in the industry who has shown dedication to the Chapter through committee involvement and who has the potential to become one of the industry’s shining stars. President’s Service Award: This award honors a board member for outstanding service to the Chapter. Ginny Solomon Golden Tuba Award: Since 1981, we have bestowed this honor on a member who has made outstanding contributions to professional services marketing and to the DC Chapter and whose accomplishments set a standard for excellence. The tuba has a rich history and symbolizes the tradition of professionalism and excellence each of us works to achieve. 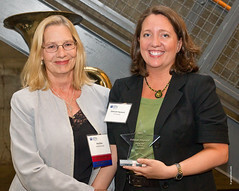 The 2010 recipient of the Gold Tuba is Carolyn Evans of Global Engineering Solutions! Carolyn is an active member who has given much of her time to the Chapter. She has served on the Lunch programs committee, the Striving for Excellence committee, and is a Past Chapter President. Congratulations Carolyn! Congratulations to all of our award recipients and thank you to everyone who celebrated with us! Photos courtesy of Galen Photograpy.